In the Galapagos Islands, there is a spot on Floreana island called Post Office Bay which has a long—and fun!—history, and the best part is visitors can still get in on the time honoured tradition. And in some cases it can even lead to new friendships- or at the very least, a great story! Back in the whaling days, sailors used to leave mail in an old barrel near the beach. Sailors heading home would look through the barrel, and if they were going near where the letter needed to be delivered, they would take it home to hand-deliver. The practice continues today, with many tourists writing postcards in hopes someone from their hometown will pick it up. When my husband and I travelled there, we dropped in a card in hopes of it ending up at his parents’ home in Arizona. It still hasn’t arrived, but my fingers are crossed! Anyway, our group dumped out the rest of the cards and shouted out locations, but as we handed dozens over to our friends from Massachusetts we quickly lost hope that any from the Calgary area would appear. Perhaps getting too into the exercise and realizing we were about to leave empty-handed, we screamed out in excitement as one addressed to Bogota, Colombia appeared. Post Office Bay in the Galapagos Islands. Now if you know anything about geography you’ve by now realized that Colombia is nowhere near Canada, but we just so happened to be heading to Bogota after the Galapagos! So we scooped up the card and headed back to the boat. About five minutes later, it sunk in that we had probably just done a really dumb thing, as Bogota is a MASSIVE city and we don’t speak Spanish—how the heck were we ever going to hand-deliver this card? And what if the address was in a sketchy area of town? And what if something awkward had since happened between the sender, Oli and his lady love Dalyla—like they’d broken up? Fast forward a week, and we’d made it to Bogota, only to learn Oli hadn’t written an actual address on the card, just a building name and area. As if this already weren’t complicated enough. Of course nothing popped up in Google or on a map, so we decided to try our luck and drive towards the general area. We made it to the neighbourhood, but despite stopping multiple people on the street no one had any idea where the building was. Then, a strike of luck: we came across a drug store! Those guys are always doing deliveries, they must know! Sure enough, we soon found ourselves in front of the building thanks to the helpful pharmacist, and asked the guard to let us up to the unit. As we picked out words in his Spanish conversation like ‘Canadians…postcard…Galapagos’, I started to think, “there’s no way this girl is letting us in, this story sounds way too crazy!” Luckily she buzzed us up, and in we went. When the door opened, we were met with a big smile by lovely Dalyla, who was rather surprised and confused about the whole thing, especially because Oli hadn’t explained the whole hand-delivered-postcard thing. As fate would have it, Oli was also there, having just got back from the Galapagos…the night before! “That was fast!” he laughed, and we chatted with them for a little bit before snapping a photo and heading off, feeling rather impressed with ourselves about the successful delivery. The happy couple, with a pristine postcard! We’d only just gotten to the car when the guard ran after us, saying Oli and Dalyla wanted to take us for coffee, could we wait? We were happy to, and the couple soon joined us downstairs, apologizing for not inviting us out right away. Understandably, they were so stunned by our appearance they needed a minute to take it all in! We spent the next hour chatting over lattes, swapping stories about our travel adventures and learning more about each other’s cultures (Oli being from England, Dalyla from Colombia and us from Canada, there are a lot of differences!). It ended up being a wonderful afternoon, and we made sure to exchange email addresses before parting ways. Despite the stress of trying to deliver the card, it ended up being a fun, memorable experience, and we’re so glad we took a chance at grabbing it back at Post Office Bay. I can only hope other people have similar outcomes, when they show up at a stranger’s door with a Galapagos postcard! Guayaquil, Ecuador: The Malecon, and being overrun by iguanas! 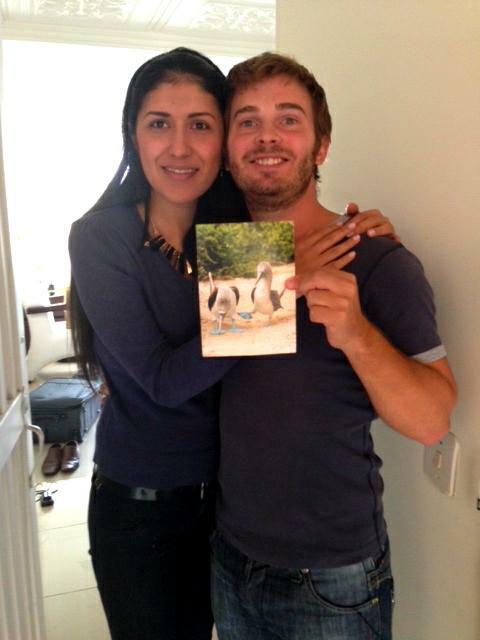 Hi Tamara– We just received our card from Floreana.. It was quite a surpise and exciting knowing where it had originated from…..
Wow that’s so exciting! I hope you were home when it arrived? Who dropped it off? So cool you got to deliver one, makes a great story! Thanks Emma, I love when unexpected things turn into fun memories! That could have gone south really fast, but luckily made for a great time in the end! Thanks Fem, glad you enjoyed it! It was definitely one of the more memorable parts of our trip! What a fun story! It’s moments like these that make you realize that we are one big global community.